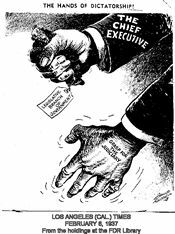 Prior Knowledge Needed: history behind The New Deal; articles I, II, and III of the Constitution; checks and balances; how the Supreme Court checks the other two branches. Student Directions: Read the background and the guidelines for how to interpret cartoons very carefully. Do not skip anything as there is a logic to how things are presented. Blue boxes are cartoons that will be explained to you. Red boxes contain questions that you must answer on separate paper. Some cartoons allow you to check your answers. Do so only after you have answered the questions. These are for practice and there should be no penalty for wrong answers. "The Judicial branch also is asked by the people to do its part in making democracy successful. We do not ask the Courts to call nonexistent powers into being, but we have a right to expect that conceded powers or those legitimately implied shall be made effective instruments for the common good." Cartoons have several different levels of meaning. Cartoon #1 is an example of Level 1, the most basic type. It is a straightforward drawing of an event or issue. It does not express an opinion by the artist. The character can be identified as a judge because of the robe he's wearing. 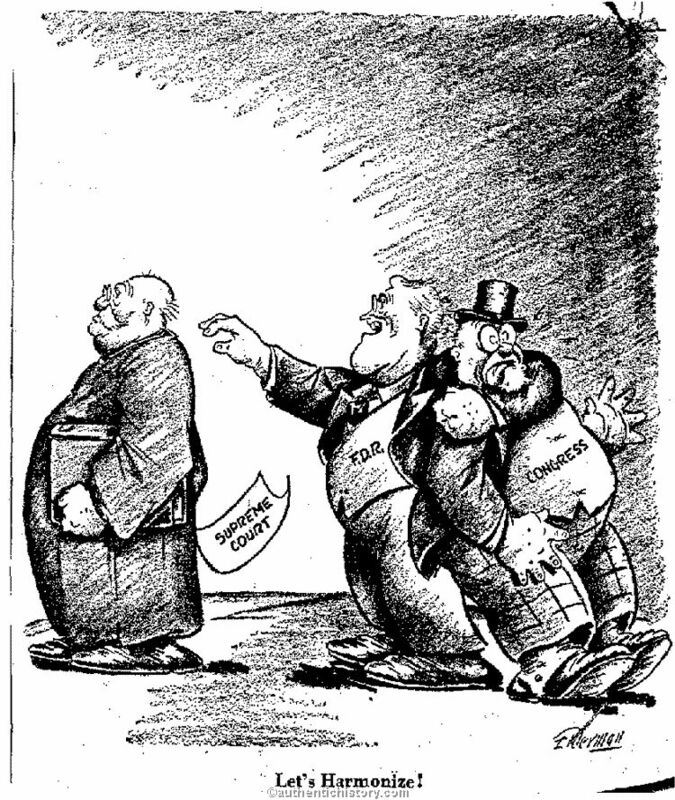 To make it more clear, the artist has written "Supreme Court" on his robe. Thus, the character represents a Supreme Court justice. 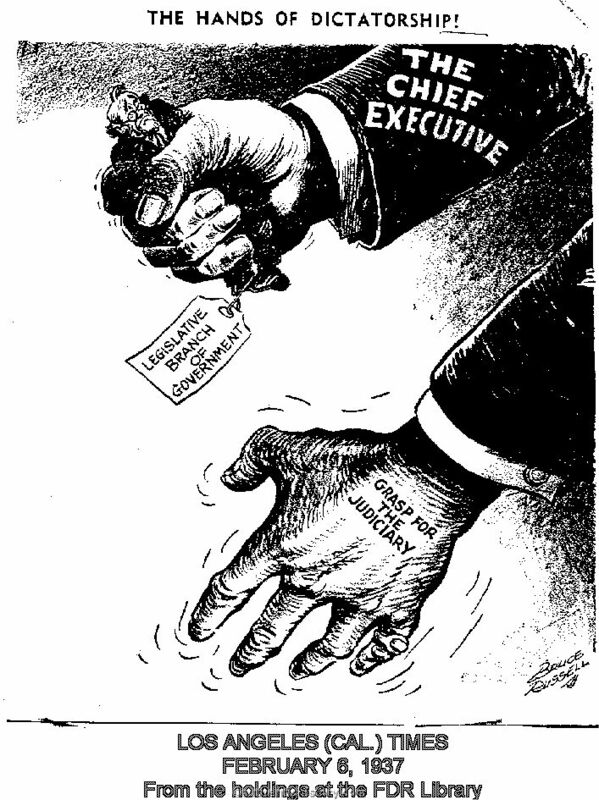 In his hand is a piece of paper with a quote from Roosevelt's State Of The Union Address, the same words quoted above. Though the president did not specifically mention the Supreme Court, it's pretty obvious he was referring to it. 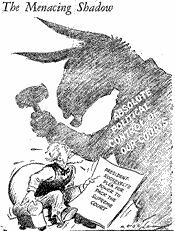 The justice in the cartoon is asking the question as to whether Roosevelt's words should be interpreted as a criticism of the Court. He's being sarcastic. Of course those words can only be seen as a criticism. 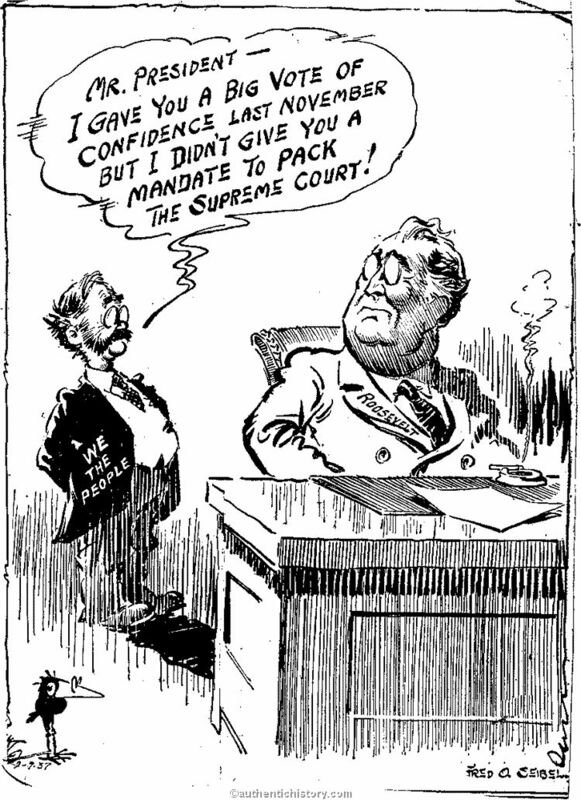 In summary, the cartoon captures the event, but does not include anything expressing the artist's own opinion about the Court's performance or Roosevelt's criticism of it. In Level 2, the artist will use a metaphor in the cartoon. A metaphor in this case refers to one thing that is interpreted as representing something else, thus making a comparison. 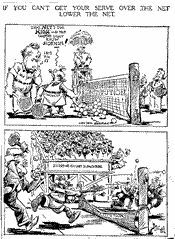 To understand the full meaning of the cartoon, the viewer must have background knowledge of what the current event/issue is being compared with. Does the scene in cartoon #2 seem familiar? 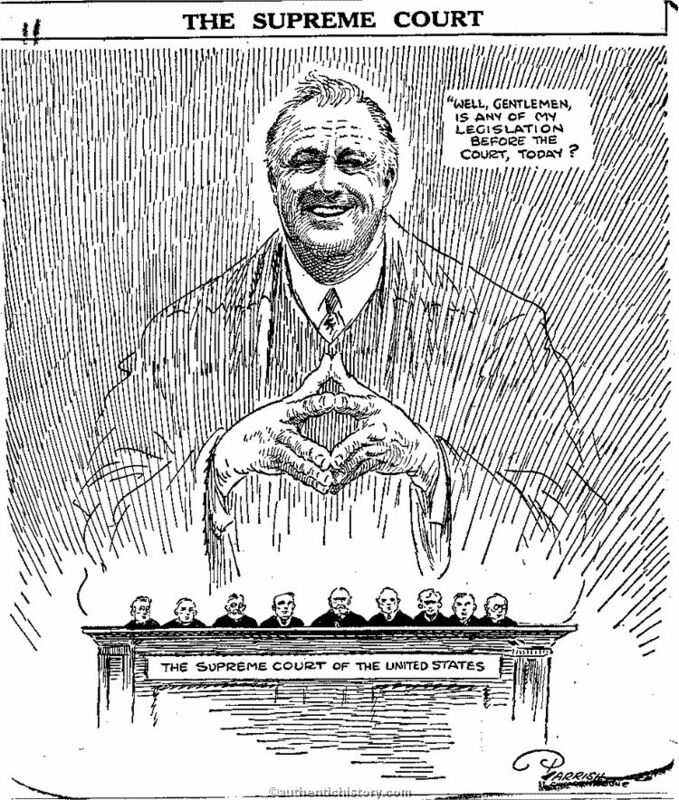 The comparison being made here is between Roosevelt's criticism of the Supreme Court, and a very famous painting called "The Spirit of '76". A.M. Willard painted this in 1876 at the centennial of America's Declaration of Independence. 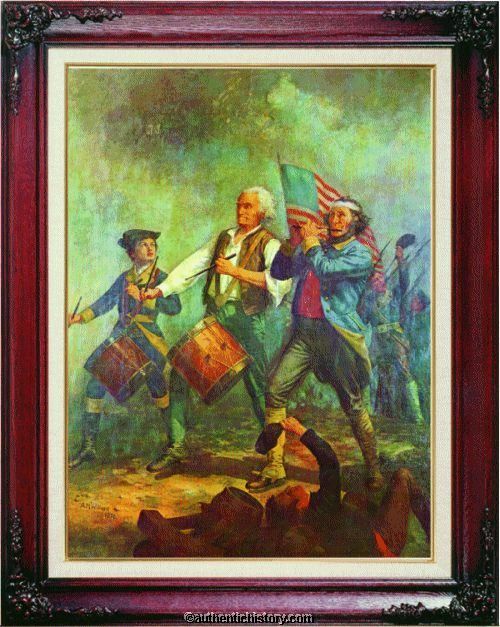 It depicts a parade during the Revolutionary War, with the soldiers marching in unison. Since 1876 it has become a very recognizable symbol of patriotism and the American spirit. 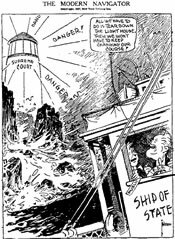 Note the title of the cartoon. In the cartoon, the 3 soldiers have been replaced by the three branches of government. The main soldier is now the president (the executive branch). The other soldiers are Congress (the legislative branch) and the Supreme Court (the judicial branch). 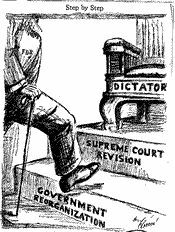 Notice that congress is in step with Roosevelt, but the Supreme Court is not. The suggestion is that the Supreme Court, by not cooperating with Roosevelt, is being unpatriotic. Does this cartoon express the author's personal opinion? Not necessarily. 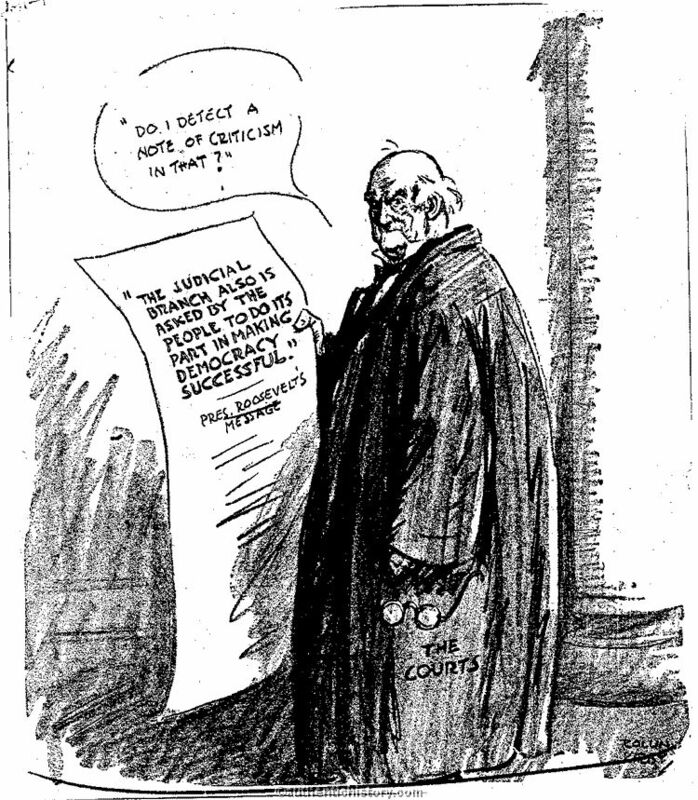 It shows that Roosevelt believes the Court is unpatriotic. That doesn't mean the artist necessarily agrees. Level 2 uses a metaphor, but still does not express the artist's personal opinion. 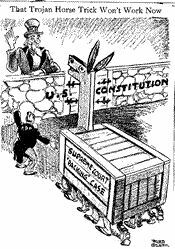 On February 5, 1937, Roosevelt sent a message to Congress recommending the reorganization of the judiciary branch of the government. Roosevelt gave two reasons why this needed to be done. First, he said: "The Judiciary has often found itself handicapped by insufficient personnel with which to meet a growing and more complex business...The simple fact is that today a new need for legislative action arises because the personnel of the Federal Judiciary is insufficient to meet the business before them. A growing body of our citizens complain of the complexities, the delays, and the expense of litigation in United States Courts." In other words, he said that there weren't enough judges to do all the work that needed to be done. Second, he said: "A part of the problem of obtaining a sufficient number of judges to dispose of cases is the capacity of the judges themselves. This brings forward the question of aged or infirm judges...In the federal courts there are in all 237 life tenure permanent judgeships. 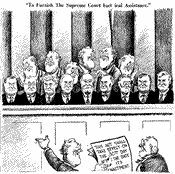 Twenty-five of' them are now held by judges over seventy years of age and eligible to leave the bench on full pay...Life tenure of judges, assured by the Constitution, was designed to place the courts beyond temptations or influences which might impair their judgments: it was not intended to create a static judiciary. A constant and systematic addition of younger blood will vitalize the courts and better equip them to recognize and apply the essential concepts of justice in the light of the needs and the facts of an ever-changing world." 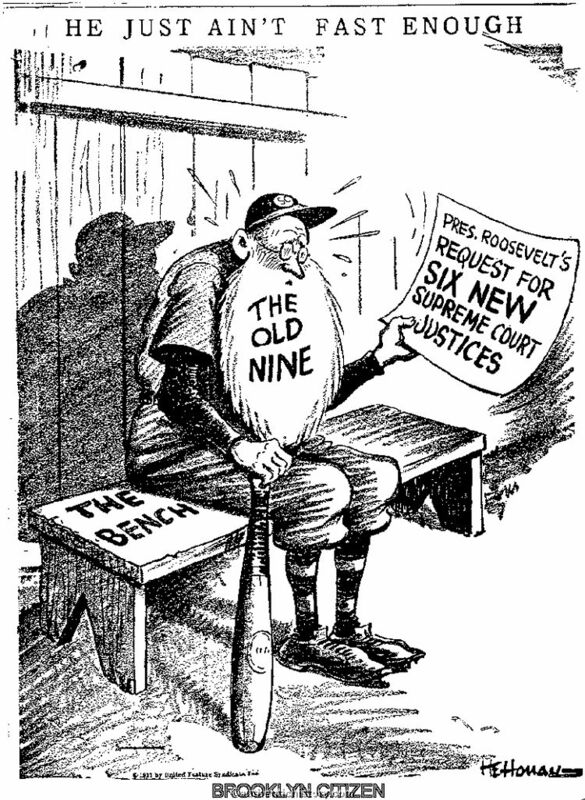 In other words, Roosevelt was saying that too many of the judges, including those on the Supreme Court, were too old! 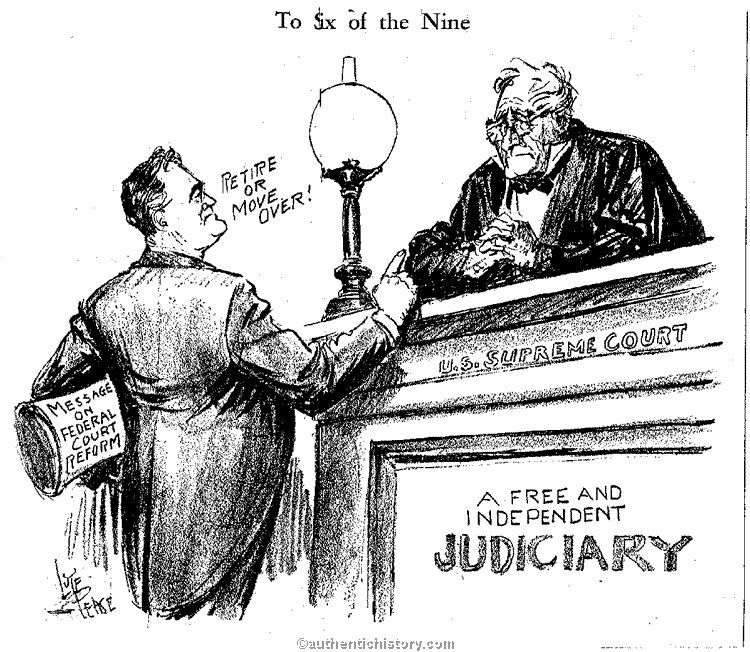 a) When any judge of a court of the United States, appointed to hold his office during good behavior, has heretofore or hereafter attained the age of seventy years and has held a commission or commissions as judge of any such court or courts at least ten years, continuously or otherwise, and within six months thereafter has neither resigned nor retired, the President, for each such judge who has not so resigned or retired, shall nominate, and by and with the advice and consent of the Senate, shall appoint one additional judge to the court to which the former is commissioned. Provided, That no additional judge shall be appointed hereunder if the judge who is of retirement age dies, resigns or retires prior to the nomination of such additional judge. 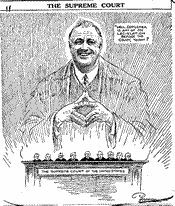 This proposal would allow Roosevelt to nominate a new Supreme Court justice for every justice with 10 years of service, age 70 or over, who refused to retire, up to a total of 15 Supreme Court justices. In other words, this proposal could increase the total number of justices from 9 to 15! Before any of this could happen, Congress would have to pass this bill into law. Before that could happen, there would be a serious public debate on the plan. The following cartoons are all from that public debate. 1. 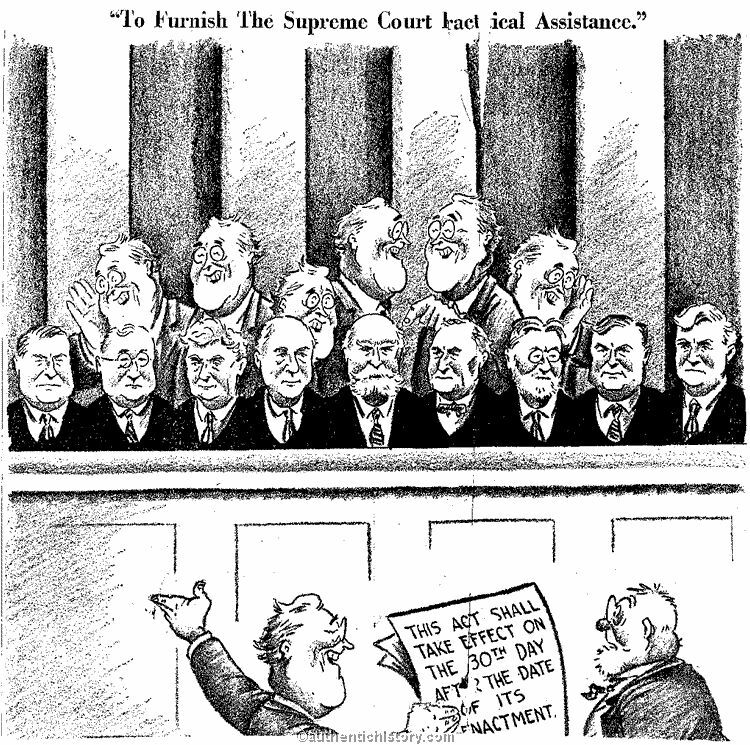 Based on the title of the cartoon, how many justices had met the 70-or-over requirements? How many new justices would Roosevelt be able to nominate if the bill became law? 2. Describe how this cartoon captures the issue. 3. 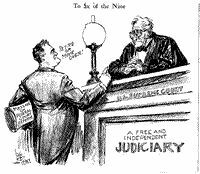 The words "A Free and Independent Judiciary" refer to Article III of the U.S. Constitution. The judiciary is supposed to be a distinct branch of the government, not part of one of the other branches. 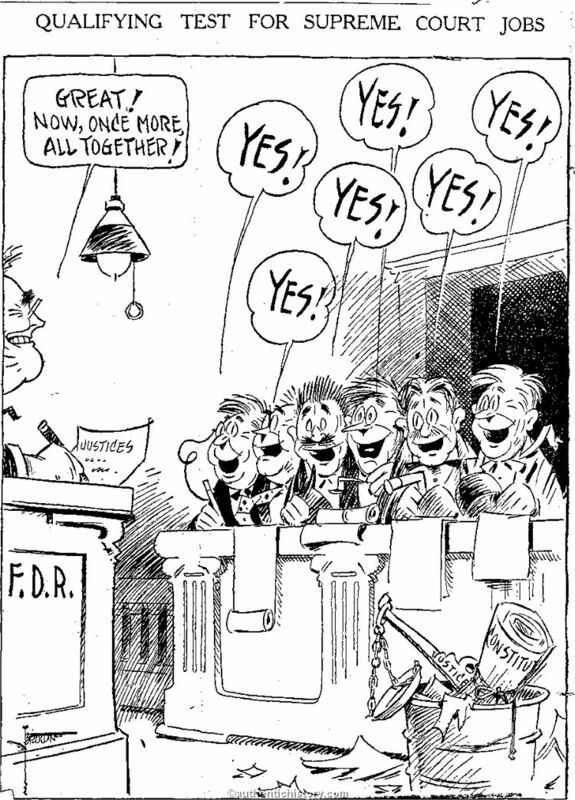 Would FDR's plan jeopardize this? Explain how it might. 4. Identify the overall metaphor. What two things are being compared? 5. Now identify each part of the metaphor. 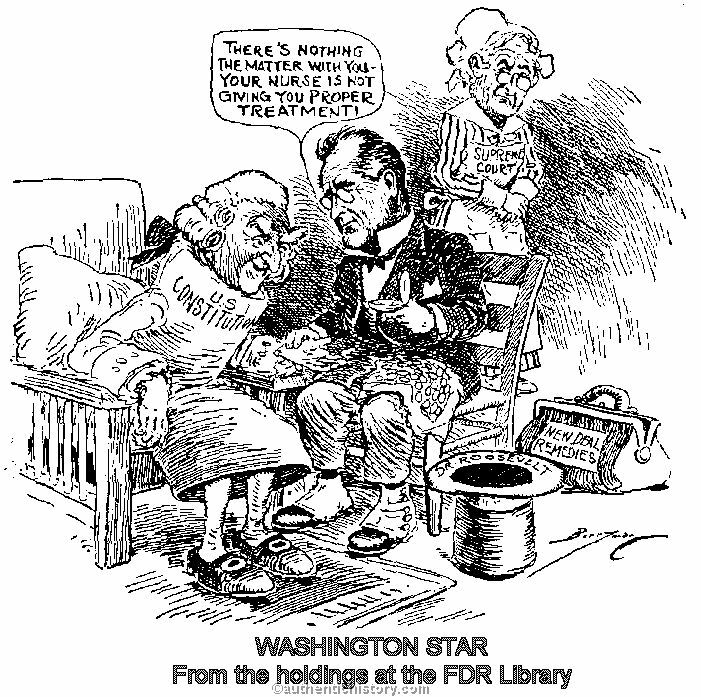 For example, the US Constitution is being compared with a sick patient. Identify three other parts of the metaphor. 6. Finally, explain the metaphor. Whose point-of-view is being expressed here? Is it Congress's? Roosevelt's? The American public's? According to that point-of-view, what is the problem and the solution? Now let's look at the next type of cartoon. 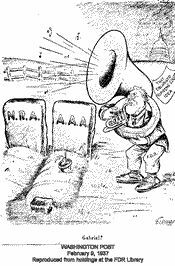 Level 3 cartoons are just like level 1 cartoons, with the difference that the cartoonist clearly expresses an opinion on the issue. 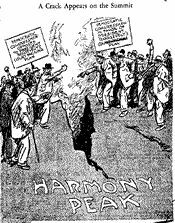 First, remember that in his State Of The Union Address, Roosevelt said that the Supreme Court was out of harmony with the other branches of government and the will of the people of the United States. 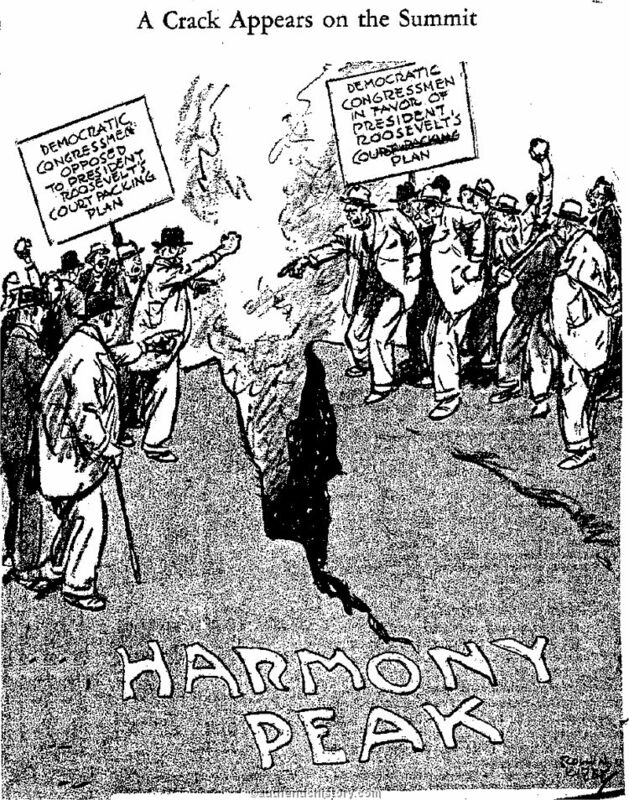 The title of this cartoon, "Let's Harmonize! 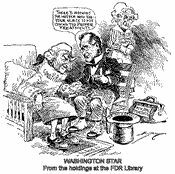 ", is a reference to FDR's speech. All three branches of government are represented here. 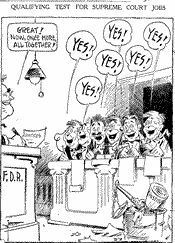 The cartoonist is suggesting that the legislative branch is in harmony with the executive because FDR has a stranglehold on it. 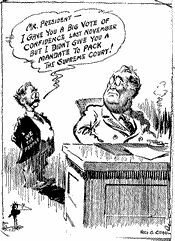 According to the cartoonist, Roosevelt's court-packing plan now has him making a grab for the Supreme Court, to force the judicial branch into "harmony" as well. 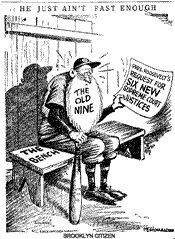 Again, it's suggested that FDR will control the court if he is able to nominate 6 new justices who all share his views on the New Deal. 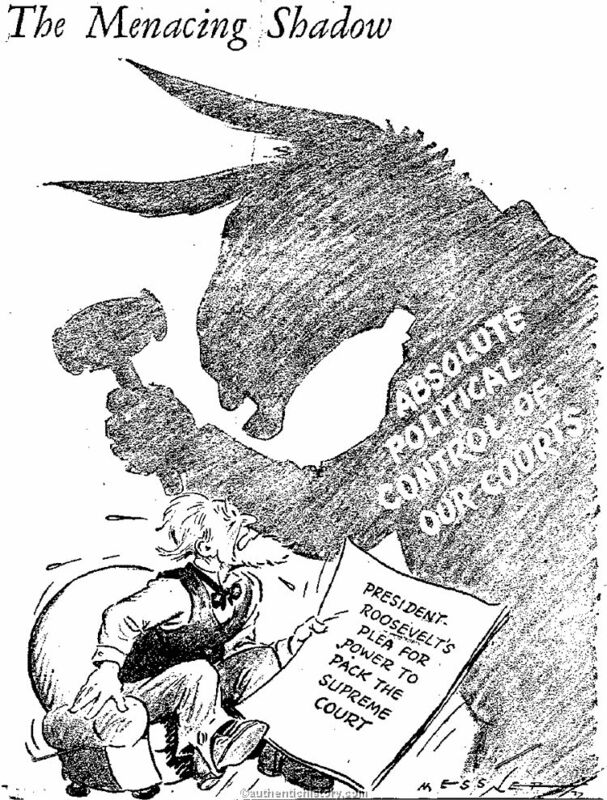 Because the action Roosevelt is taking is being portrayed as negative, we know that the cartoonist is criticizing Roosevelt and his plan for reorganizing the judiciary branch. 7. This cartoon is very similar to the previous one. Explain what's going on. 8. 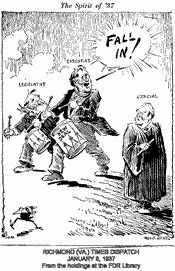 Does the cartoonist sees Roosevelt's court-packing plan as something positive or negative? 9. Explain how this cartoonist's opinion is even stronger than the opinion of the artist of #5. Now it's time for the final type of cartoon. Level 4 cartoons use metaphors and clearly express the cartoonist's opinion on the issue. 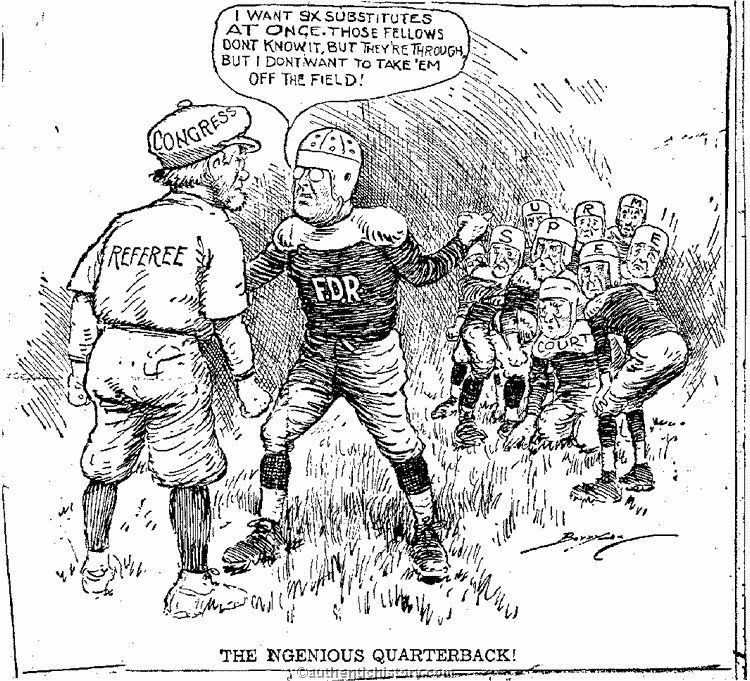 In "The Ngeneious Quarterback," the cartoonist uses a football metaphor. The quarterback is getting ready to run his next play. 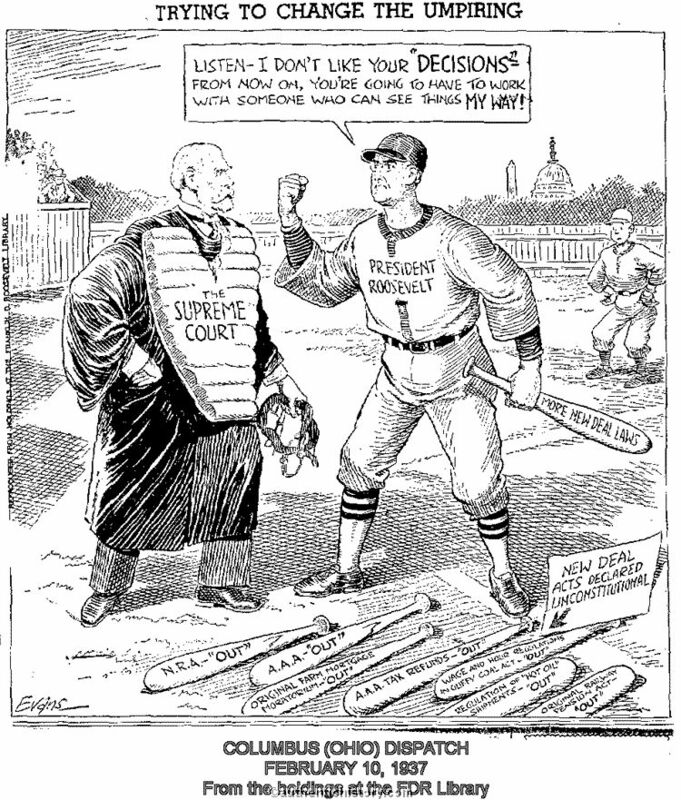 FDR is the quarterback, Congress is the referee, and The Supreme Court is the team. 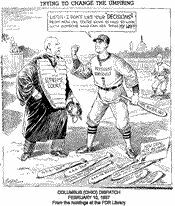 FDR says that the players on the field are through (the justices are too old), but he doesn't want them taken off the field, Instead, his idea is to ask the referee (congress) for six substitutes (6 new Supreme Court justices. Congress would be able to supply these substitutes by passing the bill to reorganize the judiciary). By using the football metaphor, the author enables us to understand the issue immediately. We all know it would be ridiculous for a quarterback to ask for 6 substitutes all at once without taking any of his players off the field. Therefore, we can tell that the cartoonist also thinks FDR's court-packing plan is ridiculous, and he wants us to think it ridiculous as well. 10. Before you analyze a Level 4 cartoon, here's a little test for you. 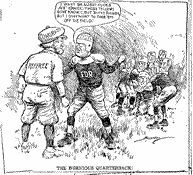 To the left and right are two more sports metaphor cartoons. One clearly expresses the cartoonist's opinion (Level 4), while the other doesn't (Level 2). Which is which? Explain why you answered the way you did. 11. Identify the overall metaphor. What two things are being compared? 12. Now identify the parts of the metaphor. 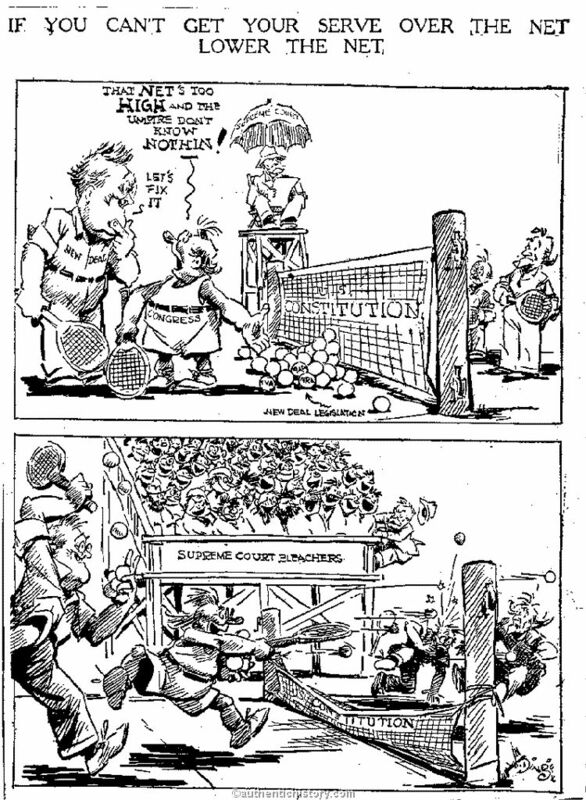 For example, the US Constitution is being compared with a tennis net. Identify four other parts of the metaphor. 13. Explain the metaphor as it's set up in the top half of the cartoon. 14. Explain the metaphor as it's executed in the bottom half of the cartoon. 15. 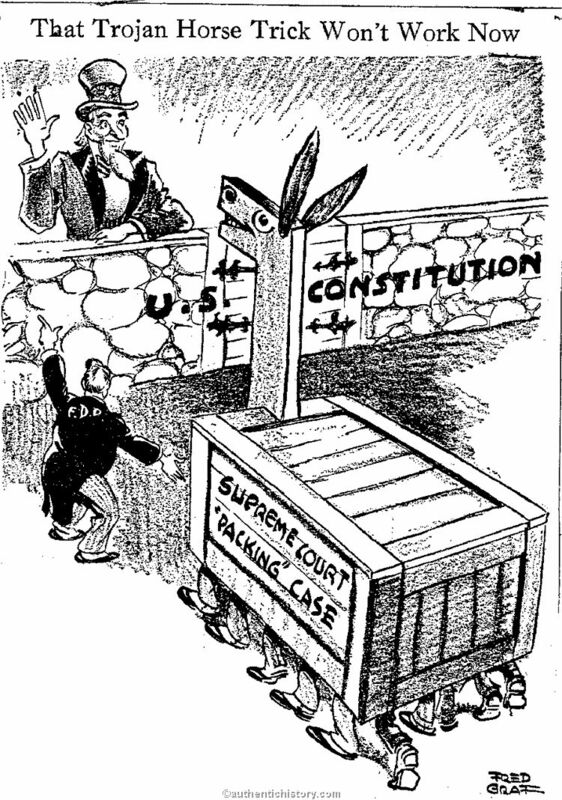 Explain the cartoonist's opinion about FDR's court-packing plan. b. 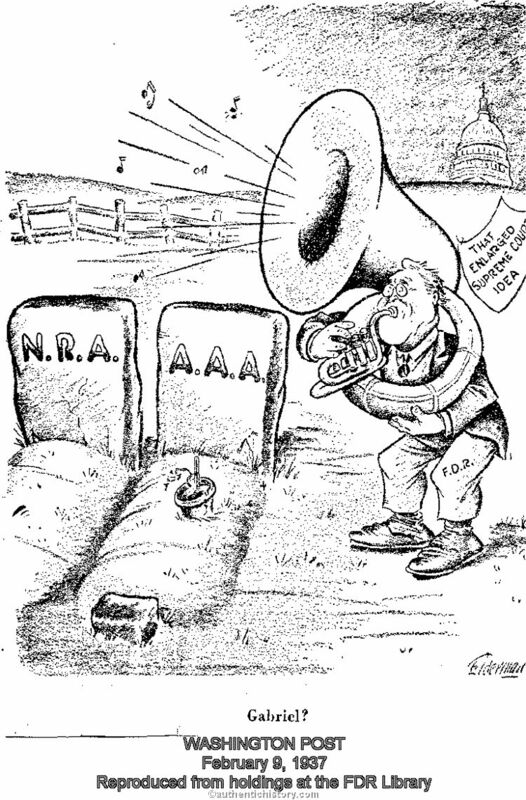 For Level 1 and 3 cartoons (non-metaphor), describe how the cartoon captures the issue. For Level 2 and 4 cartoons, describe the metaphor used. c. For Level 2 and 4 cartoons, explain each part of the metaphor. d. For Level 3 and 4 cartoons, describe the cartoonist's opinion. Check your answers with your instructor. But just as the opposition was at its peak, some unexpected events changed the situation. 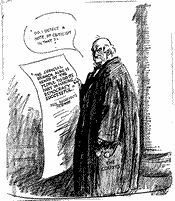 In March the Supreme Court upheld as constitutional both the Wagner Act and the Social Security Act (two New Deal programs), and in May Justice Van Devanter, one of those who had opposed Roosevelt, announced his retirement. 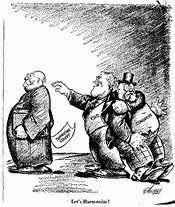 The appearance of Court support for his policies and an opportunity for a Supreme Court appointment made Roosevelt's court packing plan suddenly seem unnecessary. The bill for reorganizing the judiciary was allowed to die in committee, remanded there by a 70-20 Senate vote. The Supreme Court remained a 9 judge panel, and still does today. Roosevelt had a court he would live with. Because he stayed in office for so long, he eventually had a huge impact on jurisprudence (the political views of the majority) of the Supreme Court anyway, as he would eventually nominate a total of eight appointments. 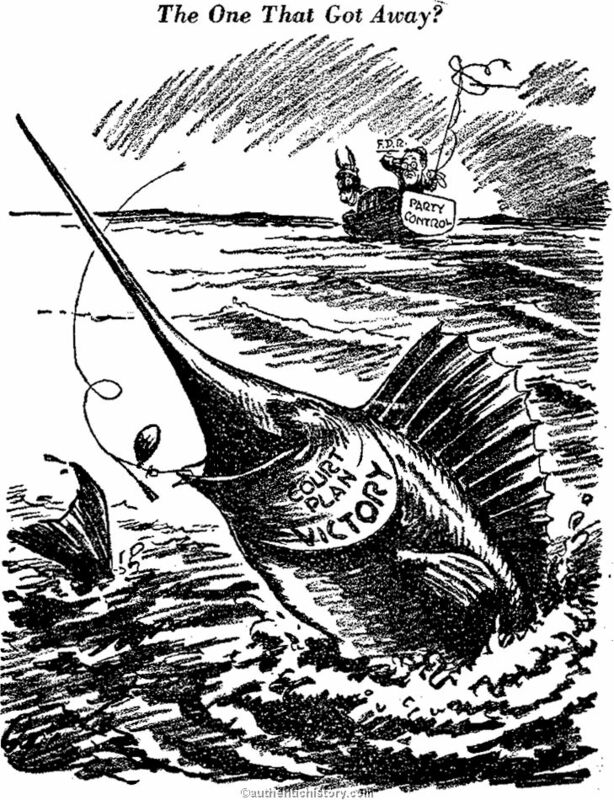 This era was the last big gasp of the New Deal. Very soon the focus would shift away from domestic issues and toward the looming crisis in Europe and in Asia that would soon erupt into World War II.